Chimera Prime and nClude digital journey to map rural communities in Africa. People who do not have a physical address lack access to essential services such as rapid emergency response to policing and medical needs, receiving post, applying for credit and registering to vote. nClude, an impact startup based in South Africa, is more than aware of the dire consequences this can have on the social, economic, and political participation of residents in these unmapped areas. Siyanda Mthethwa, Founder at nClude, has a personal attachment to the issue, because of his experiences being raised by his grandmother in Gingindlovu, a town in Uthungulu District Municipality in the KwaZulu-Natal province of South Africa. Photo of Siyanda Mthethwa with his grandmother. Siyanda and the nClude team wanted to develop a digital solution that would have a positive impact on developing countries and rural communities. They endeavored to launch and implement a successful pilot project in Siyanda’s home village Gingindlovu. nClude reached out to Chimera Prime to build an app that would map and create addresses for households, clinics and other buildings. Photo of Siyanda Mthethwa and Krystian Sulek in South Africa rural areas. 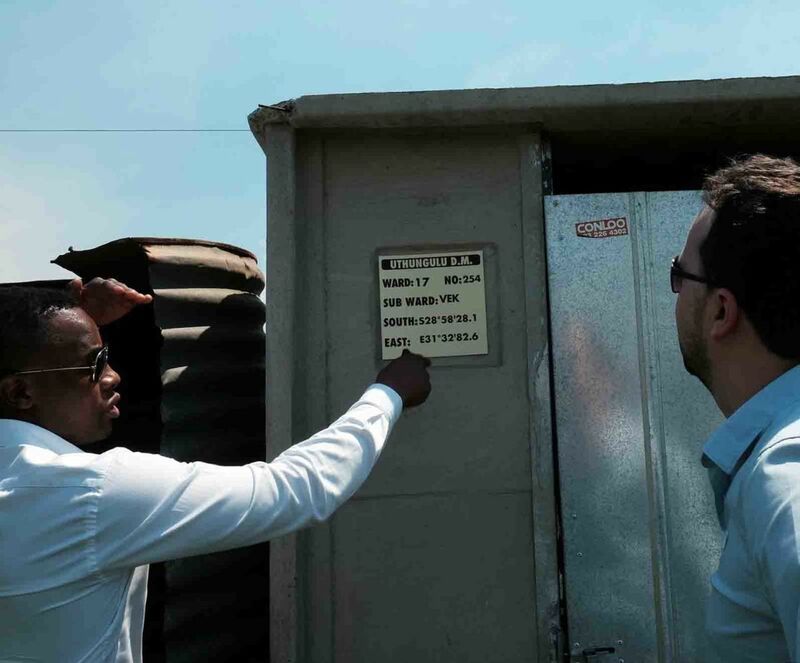 With the pilot location and a capable development partner selected, Siyanda and Krystian Sulek, the CEO of Chimera Prime, traveled to South Africa to meet the local people, get the permissions from local authorities and a better understanding of the situation. They have met with local community representatives, the GIS (geographic information system) experts, service delivery departments, the Department of Health, police, and private business people to help understand the challenges. When you are looking to implement a project as big as this one, you need to have your heart in the right place. Mapping projects like this have been tried before with limited success, so how do you make it work? There were several challenges to overcome before the pilot test could start. Challenge 1: Piloting and pioneering is more about local culture and people than about the technology. At the unknown territory the partnership between Chimera and nClude needed to be very fluid and flexible in order to accommodate the different cultures, communities, and businesses working toward the common goal. Challenge 2: Many companies tend to build products they believe are needed without ever conversing with end-users. Chimera, however, believes in building products people actually need. This meant the solution must to be planned and developed with the help of locals in order to fully understand their issues and needs. As such, Chimera spoke with local representatives to discuss the problems facing people from rural areas. But this brought on a new challenge: building trust within the community. 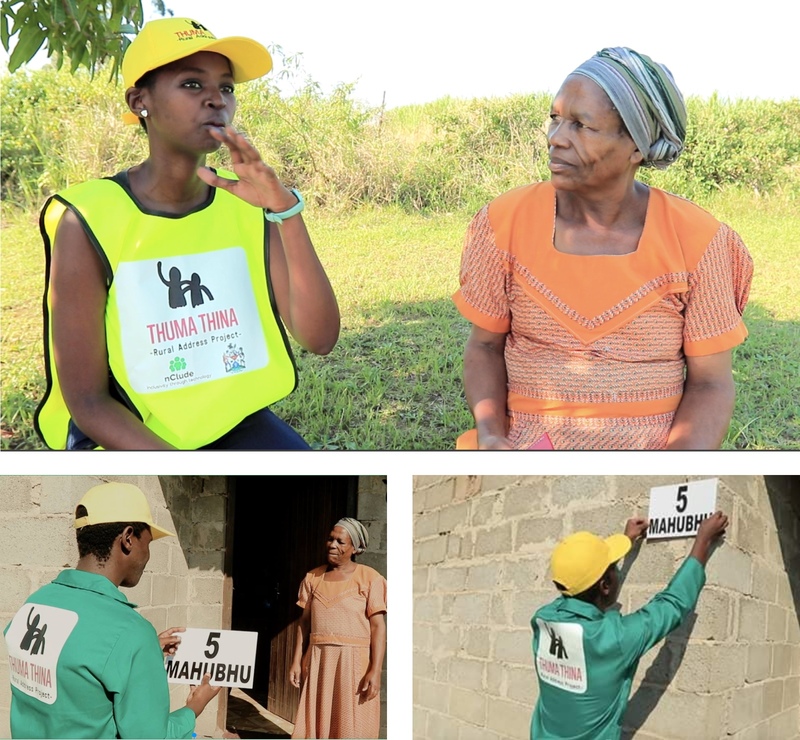 To help instill such connection, the official name for the volunteer group became Thuma Thina, which means “send us”. It symbolizes a call for young people to come together and work towards a common goal. Challenge 3: The app needed to be capable of scaling efficiently and effectively after a successful pilot launch. Chimera used programming methodology known as SCRUM to enable the team to produce a solution in a very short time span and focused on building an app based on feedback and direction from the client. Enabling developers and designers to work directly with the end-users gave them more ownership of the project and a personal understanding of their needs. It also meant the app was produced faster and far more efficiently than if it were produced by a large organization. The team brainstormed many options to solve the challenges that faced them. In the end, the solution envisioned by Chimera was to create a few simple apps that could be used by almost anyone. Before starting development of the final product, a clickable prototype was created to validate the assumptions. This helped to save a lot of time on corrections later on. It was also the easiest way to communicate the idea to nClude and other parties, and ensured everyone was on the same page. The first application was created to get a good base of people that had the skills to do the mapping. It’s a simple app where people can register themselves as a person interested in helping with the mapping. Then they would have a test to see if they have enough skill and knowledge to help. The second application is where the mapping happens. It’s the one that the teams use to go from house to house to gather information and add location data to the map. The pilot program began on August 1, 2018. This involved daily discussion with small local groups in order to directly discuss the product and make sure it actually solved the problem. Photo of the Ambassador installing address on the house. Communication proved to be the most critical component of the partnership. nClude and Chimera Prime were in constant communication, and provided all technical assistance needed on the field. The team at Chimera worked tirelessly around the clock to deliver the applications, and make changes and improvements during the pilot. The Thuma Thina team also needed direct training from Chimera. Siyanda started with a workshop for everyone who was involved in mapping to show them how the applications work. Pointing out that the quality of the data is the most important and explaining how to talk with people. Most of the team had never worked in such a way that is common in most startups; and didn’t understand technology very well. After the workshop the team started mapping. Then of course, lots of issues popped up; from not being able to take proper photos, to problems launching the application on low cost devices. Another issue was that the app had to be really simple to use, and testers quickly found that the first iteration wasn’t simple enough. Chimera quickly resolved this, and they were in regular communication with the team on the ground to fix bugs and issues immediately. After two to three days everything was more stable. nClude’s Thuma Thina ambassadors turned out to be very capable and competent in acquiring data and using the application. Rural youth in South Africa have harnessed the power of technology and the utilisation of smartphones, and community members met all ambassadors with kindness and positivity, which created an open environment that enabled the project to run smoothly. Screenshot of the map preview with ~1560 houses mapped during the pilot phase. Having an address has enabled rural households in the project to access emergency services, post, and most importantly, receive essential government infrastructural benefits like water, electricity, and toilets efficiently. Other community oriented institutions like schools, kindergartens and clinics will be able to be exposed to international donors. The project and the solution as a whole was well received by the community and potential clients. The local municipality of uMlalazi has invited nClude to deliver a proposal and business plan aimed at mapping the whole municipality which comprises of 39,000 rural buildings. The proposal has been submitted and awaits municipal executive council approval in December of 2018. If the proposal is approved, the mapping and addressing of the whole municipality will commence in January 2019.